Inshore water temperatures are ranging from about 68-70 in the Little River area. Water clarity has been pretty good, but with the big rain this morning visibility has declined. 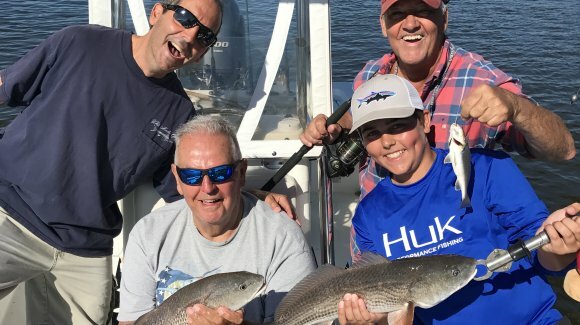 It’s been a good month for fishing in the Little River area, and Captain Patrick “Smiley” Kelly (843-361-7445) reports that inshore fishing has been pretty consistent with a little bit of everything biting right now. Trout have been hitting well on Vudu Shrimp and Gulp! Shrimp fished under popping corks, and topwater plugs and Mirrolures have also been working well. Fish are mostly being caught along ledges and drop-offs in the ICW where the depth goes from about 5 feet down to 13, and the best bite for trout (like most species) has come on the incoming tide. Most of the trout being caught have been keeper-sized. This spring the redfish population seems to have rebounded from last year, and while Captain Smiley’s boat is not catching a lot of big fish they are catching plenty of 17-20 inch redfish. The fish are biting around oyster beds and docks, with the best success coming with mud minnows or Gulp! Shrimp fished on a ¼ ounce jighead. Again the rising tide has been best. The black drum fishery is also strong, and black drum are biting well on cut shrimp fished around bulkheads, docks and deep holes with oyster bottoms. 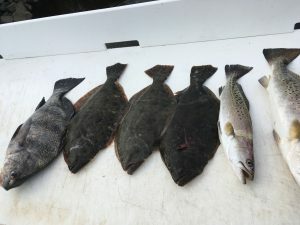 There has been a very good run of bluefish so far this spring, and lots of 18-inch fish as well as some random, very large fish up to 10 pounds or more have been caught inshore. They will eat topwater plugs, live bait and most anything that moves. Inshore fish have been caught on the outgoing tide around deeper holes where water runs across shell beds, and they are also in the Little River Inlet around the jetties. Flounder traditionally move into all the other inlets along the Grand Strand (Murrells Inlet, behind Pawley’s, Tubbs, etc.) before they migrate back into Little River Inlet, and this year appears to be no exception. Already they are catching lots of short 12-inch fish as well as some occasional 15 inchers, but the better flounder on up to doormat size have certainly not shown up yet.